Since signing the Carbon Reduction Agreement last year, both parties have managed to save 10,000 tons of carbon dioxide up- to- date. The program, which is part of a five year lasting strategic partnership between both players, continues in the coming years, reducing greenhouse gas emissions through combined efforts by an additional 10,000 tons until 2020. This is a figure which has food for thought: roughly 40 percent of all direct and indirect greenhouse gas emissions set free by logistics giant DB Schenker results from the transport of air cargo. Way too much, thought the management. It's time to take action. As a leading logistics service provider, "we bear a particular responsibility when it comes to planning and implementing our emissions-intensive transports," emphasizes Dorothea Schoen, who is responsible for climate protection and CO2 controlling at the Deutsche Bahn daughter. 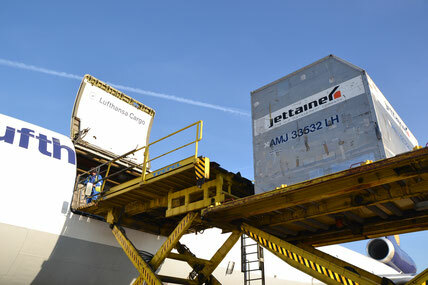 Therefore, pacting with LH Cargo was a logical step for DB Schenker, since the freight carrier is at the forefront of the climate saving issue for some time now. This is confirmed by Bettina Jansen, LH Cargo's Head of Environmental Management when presenting various fields of activities that led to successive fuel savings and reduced CO2 emissions, lowering the carriage costs as well. According to Bettina, her company's mixed freighter fleet only needs 1.89 litres of fuel on average to transport 100 kilograms over a distance of 100 kilometers. Mrs Jansen states: "We are putting in an enormous effort to continuously reduce our fleet's fuel consumption." She goes on to say: "In addition to this, we are using particularly lightweight containers, polishing even our turbine blades for gaining maximum operational efficiency and are constantly driving the digitization of air cargo documents together with our business partners further ahead." This way, the airline has become a benchmark for the air freight industry regarding environmental achievements. Initiatives, that are fully in line with DB Schenker's own objectives, as Dorothea Schoen remarks: "Leading air freight companies such as Lufthansa Cargo are playing a pivotal role in our improved environmental performance. The joint environmental steps agreed by DB Schenker and partner LH Cargo "are milestones as they allow us to incorporate sustainibility aspects into business relationships," concludes Andrea. LH Cargo speaker Andreas Pauker told CargoForwarder Global that in addition to DB Schenker his company cooperates with Kuehne + Nagel, DHL and Hellann Worldwide Logistics in environmental issues.